There’s nothing to say. Just look, drool, make… repeat. *Note: I used Jell-O brand and used buttermilk instead of regular milk. Make sure to beat the mixture for several minutes until very thick! 1. Follow the directions for the “no bake” cheesecake filling. 2. In a separate bowl mix together 3/4 cup of the cheesecake filling and 1/2 cup of softened cream cheese until thoroughly combined. Set aside. 3. Wash and dry all of the strawberries and cut the tops off. Strawberries naturally have a hollow center so we’re just trying to expose that and widen the hole a little bit with a sharp knife. If there’s a lot of juice from cutting into the berry you can use a paper towel to soak up some of it before putting in the filling. 4. Fill a piping bag with the cream cheese mixture and pipe it into the center of the strawberries until they are full and the filling comes out the top– the mixture is thick enough that it will hold its shape and be very pretty. 5. Place the berries on a drying rack and microwave the chocolate discs in a microwave-safe bowl in 30 second increments (mixing in between) until it is completely melted and smooth. 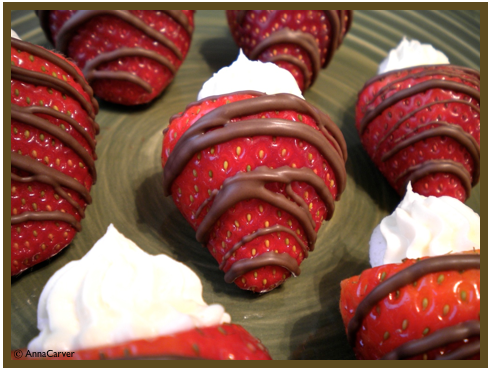 You can either drizzle the chocolate over the strawberries with a spoon or fill a plastic bag and cut off the tip. 6. Keep in the fridge until ready to serve. These can be made easily ahead of time, but are best if made the day that you want to serve them! Next Next post: Not A Playa, I Just Crush A Lot… Valentine’s Dinner!